Hot air balloon themed set for boy's Greek Orthodox Baptism. Handmade with dark blue and white fabrics. It has been decorated with metal airplanes and fabric hot air balloons.The set includes lampada, ladopana, suitcase, three candles, soap, oil bottle underwear and towels. 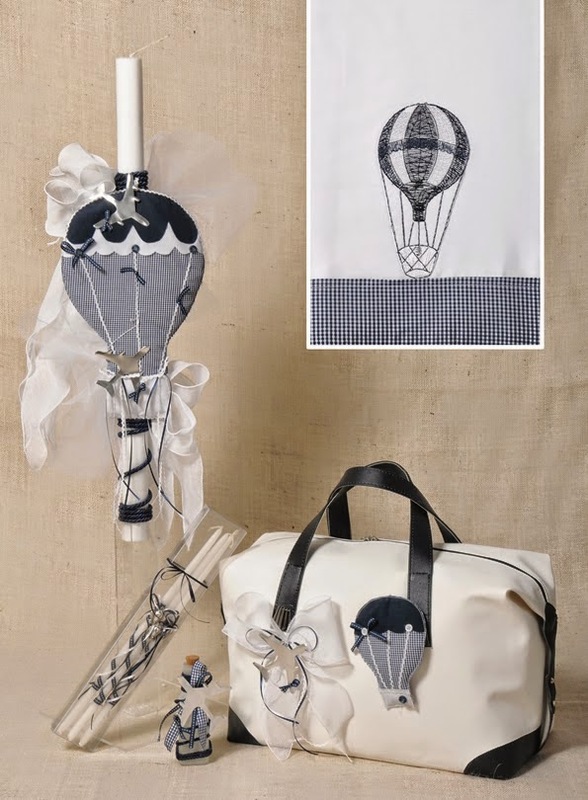 https://www.preciousandpretty.com/2015/03/greek-baptism-set-hot-air-balloon-e125.html Greek Wedding Favors|Orthodox Crowns|Stefana|Baptism Invitations Greek baptism set hot air balloon E125 Greek baptism set for boy hot air balloon themed Product #: Greek Wedding Favors|Orthodox Crowns|Stefana|Baptism Invitations_8402624545836925350 5 stars out of 5 reviews.